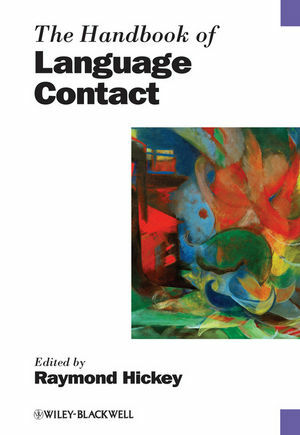 The Handbook of Language Contact offers systematic coverage of the major issues in this field – ranging from the value of contact explanations in linguistics, to the impact of immigration, to dialectology – combining new research from a team of globally renowned scholars, with case studies of numerous languages. Raymond Hickey is Professor of Linguistics at Essen University, Germany. His main areas of research are varieties of English (especially Irish English) and general questions of language contact, shift, and change as well as computer corpus processing. He has published widely, the most recent titles being A Sound Atlas of Irish English (2004), Legacies of Colonial English (2004), Dublin English: Evolution and Change (2005), Irish English: History and Present-Day Forms (2007), and Eighteenth-Century English: Ideology and Change (2010). He has also published over 80 articles on various issues within linguistics and produced an electronic corpus of Irish English. Language Contact: Reconsideration and Reassessment (Raymond Hickey). Part I Contact and Linguistics. 1 Contact Explanations in Linguistics (Sarah Thomason). 2 Genetic Classification and Language Contact (Michael Noonan). 3 Contact, Convergence, and Typology (Yaron Matras). 4 Contact and Grammaticalization (Bernd Heine and Tania Kuteva). 5 Language Contact and Grammatical Theory (Karen P. Corrigan). 6 Computational Models and Language Contact (April McMahon). Part II Contact and Change. 7 Contact and Language Shift (Raymond Hickey). 8 Contact and Borrowing (Donald Winford). 9 Contact and Code-Switching (Penelope Gardner-Chloros). 10 Contact and Dialectology (David Britain). 11 Contact and New Varieties (Paul Kerswill). 12 Contact and Change: Pidgins and Creoles (John Holm). Part III Contact and Society. 13 Scenarios for Language Contact (Pieter Muysken). 14 Ethnic Identity and Linguistic Contact (Carmen Fought). 15 Contact and Sociolinguistic Typology (Peter Trudgill). 16 Contact and Language Death (Suzanne Romaine). 17 Fieldwork in Contact Situations (Claire Bowern). Part IV Case Studies of Contact. 18 Macrofamilies, Macroareas, and Contact (Johanna Nichols). 19 Contact and Prehistory: The Indo-European Northwest (Theo Vennemann). 20 Contact and the History of Germanic Languages (Paul Roberge). 21 Contact and the Early History of English (Markku Filppula). 22 Contact and the Development of American English (Joseph C. Salmons and Thomas C. Purnell). 23 Contact Englishes and Creoles in the Caribbean (Edgar W. Schneider). 24 Contact and Asian Varieties of English (Umberto Ansaldo). 25 Contact and African Englishes (Rajend Mesthrie). 26 Contact and the Celtic Languages (Joseph F. Eska). 27 Spanish and Portuguese in Contact (John M. Lipski). 28 Contact and the Development of the Slavic Languages (Lenore A. Grenoble). 29 Contact and the Finno-Ugric Languages (Johanna Laakso). 30 Language Contact in the Balkans (Brian D. Joseph). 31 Contact and the Development of Arabic (Kees Versteegh). 32 Turkic Language Contacts (Lars Johanson). 33 Contact and North American Languages (Marianne Mithun). 34 Language Contact in Africa: A Selected Review (G. Tucker Childs). 35 Contact and Siberian Languages (Brigitte Pakendorf). 36 Language Contact in South Asia (Harold F. Schiffman). 37 Language Contact and Chinese (Stephen Matthews). 38 Contact and Indigenous Languages in Australia (Patrick McConvell). 39 Language Contact in the New Guinea Region (William A. Foley). 40 Contact Languages of the Pacific (Jeff Siegel).